As a new beekeeper I wanted to know what happens in the life of bees throughout the entire year and what my contribution to caring for my bees would be each month. So I have compiled this list to help you. I went to several sources and collected all the advice I could find on what happens when in the hive and what I need to be doing as a beekeeper. Of course, your area may be different slightly due to weather, climate, the type of bees you are raising etc. But, you will get the idea. If this is your first year of beekeeping, then beginner beekeeping needs to start now! Don't wait till it warms up to get things moving. Spring will get here before you know it! Occasionally on a warmer day (about 45-50 degrees) the workers will make cleansing flights. Bees will consume about 25 pounds of stored honey this month. If there is heavy snow, make certain the entrance to the hive is cleared to allow for proper ventilation. If a January thaw presents itself (in January or February) you provide supplemental, emergency food for the bees such as fondant (on the top bars) or granulated sugar (on the inner cover). This is a great time to catch up on your reading about bees, attend bee club meetings, and build and repair equipment for next season. Order package bees (if needed) from a reputable supplier. Just because there is snow on the ground, don't get the idea that this isn't the idea that there isn't much going on in the beekeeping business plan. There are still no drones in the hive. The queen will begin to lay a few more eggs each day. Workers will take cleansing flights on mild days. The bees will consume about 25 pounds of honey this month. Attend those bee club meetings. Read. There is always something new to learn about how to keep bees. Keep building those supers and putting together frames. You always need more than you expect. Bees and Beekeeping in March begins to get more exciting as you see the activity increase at the hive entrance! This is the month when colonies can die of starvation. However, if you fed them plenty of sugar syrup in the autumn this should not happen. With the days growing longer, the queen steadily increases her rate of egg laying. More brood means more food consumed. The drones begin to appear. The bees will continue to consume honey stores. Early in the month, on a nice mild day, and when there is no wind and bees are flying, you can have a quick peek inside your hive. It's best not to remove the frames. Just have a look-see under the cover. 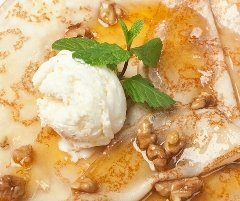 If you do not see any sealed honey in the top frames, you may need to provide some emergency food (fondant or granulated sugar if cold temps prevail, syrup if the weather is mild). But remember, once you start, you should not stop until they are bringing in their own food supplies. If you are going to do a spring Varroa mite treatment, now (or soon) is the time to start its application. Vegetable shortening patties and menthol should go into the hive as treatments for tracheal mites. The shortening is particularly helpful because it works better than menthol in cool weather. If you use Apicure (formic acid) gel packs for varroa control, this is a good time to put them in the hives. Apistan or Checkmite strips should be installed if they were not installed in February. If the bees are low on honey, feed with sugar syrup. This will boost brood rearing. The best time is when the weather is predicted to be warm (highs of 60o or above) for several days. The bees will not break their cluster to take the syrup during cold weather. Include Fumadil B mixed into the syrup, to control nosema disease. Nosema disease hurts the bees’ ability to rear brood. A good start on brood rearing in spring time is essential for honey production or crop pollination later on. Remove the entrance reducer, a wooden strip that restricts the entrance of the hive. The bees will soon need more room to come and go. Be sure you have your empty frames, supers, and new foundation ready. Beekeeping supply companies experience a rush of orders from last-minute beekeepers in April. If it happens to be a good year for honey you don’t want to miss it because you didn’t order equipment in time. Look for new apiary sites, especially if you plan to add to your number of hives. The need for windbreak will be most apparent in winter and spring. The hives should also have direct sunlight from the south and east. Easy access by car or truck is also a plus, if you plan on hauling a good honey crop. Later in the spring, look for bee forage in the vicinity. Pasture, tobacco fields, and most cultivated farm land is “desert” as far as the bees are concerned. The weather begins to improve, and the early blossoms begin to appear. The bees begin to bring pollen into the hive. Brood rearing should really increase through this month. If it does not, your hive has serious problems. The queen is busily laying eggs, and the population is growing fast. The drones will begin to appear. In particular, keep an eye on the 5-day weather forecasts. A week of cold rain could really hurt the brood rearing. Feed the bees if you see this coming and the hive does not have at least a frame or two of stored honey. On a warm and still day do your first comprehensive inspection. Can you find evidence of the queen? Are there plenty of eggs and brood? Is there a nice pattern to her egg laying? Later in the month, on a very mild and windless day, you should consider reversing the hive bodies. This will allow for a better distribution of brood, and stimulate the growth of the colony. You can begin to feed the hive medicated syrup. Add a second deep hive body when the brood, pollen and honey have nearly filled the first body. This extra space will help reduce swarming. The loss of productive bees in a swarm is your main threat in late spring. Remove the tracheal mite treatments. Problems with tracheal mites can continue even if you did put the treatments on in March. But as long as the hive is rearing brood, healthy bees will be replacing those with tracheal mites. Remove the varroa mite treatments according to when they were installed in February or March. Treat your hive with Terramycin to prevent American Foulbrood (AFB) disease. This is especially important if you have had problems with AFB in recent years or have purchased used equipment. Be sure this treatment is completed before you put honey supers on your hives. This is a good month to re-queen your hive, if the queen you have now is weak or is at least two years old. If your queen is only a year old, watch the brood pattern develop through the spring months. If the amount of brood is considerably less than it was last year at this time, think about possible causes : mites, nosema or bad weather. If you can rule out these causes, look closely at the queen. Is she long and fat, or about as small as the worker bees? A good queen will be considerably longer than a worker bee once she has started to lay eggs. Does she move all of her legs normally as she walks across the comb? An injured queen must be replaced. If she is shiny, small and “bald” she has been attacked by the workers who have chewed the hair from her. Such a queen must be replaced as soon as possible. strawberries, pears, cherries or apples in April, a strong hive is much better than a weak one. the pollen from one blossom to another — the essence of pollination. The nectar and pollen should begin to come into the hive thick and fast. The hive should be bursting with activity. The queen is laying eggs day and night, often over 1000 daily. There are now enough bees to take care of all the brood. The hive is making honey very quickly, even several pounds daily. If the bees need to make wax they will do this quickly by building onto foundation in your frames or by filling in empty spaces with burr comb. Drone production increases greatly and many drones fly out on sunny afternoons in search of the mating areas. Swarming becomes a very important factor. May is the ideal time for a colony to reproduce, and most colonies will produce “swarm cells”, or queen cells that will mature in time for swarms to issue from the hive. Your swarming bees can be a nuisance to the neighbors. Spring mite treatments should be completed, and removed prior to adding any honey supers. Add a queen excluder, and place honey supers on top of the top deep. Attend bee club meetings and workshops. In May and June you and the bees are rewarded, or disappointed, by how well you prepared for the honey flow. You may also be busy keeping up with your bees. Serious beekeepers do not take long vacations in May. If your bees are healthy, everything happens this month. The hive is full of young bees, the weather is almost perfect, and honey plants are blooming everywhere. Check your hives weekly and add supers as needed. Be sure there is plenty of space above the brood nest for honey. Frames with new foundation should go in. 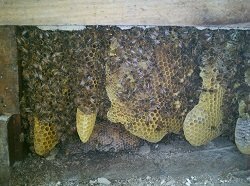 A strong hive will draw out the foundation into new comb in just a few days if the weather is good. In a hive with two deep brood boxes, the bees will often move to the upper brood box, leaving the lower box relatively empty. This is an inefficient use of space in the hive and can lead to swarming. In May or June it is useful to “reverse” these brood boxes. This means removing all of the boxes, placing the second box on the bottom board where the first box had been, and placing the first box above it. This may break the brood cluster. So check the weather forecast and do this when at least two warm days are coming. The bees will need to rearrange their cluster, and less brood will be lost in the process if it is not exposed to cool weather much below 50°. Hold a honey frame horizontally and shake it over the hive. If nectar sprinkles out, your bees are on a honey flow. The nectar is still dilute and watery. With time, the bees will either consume it or continue to thicken and ripen it into honey. Swarm collecting has been a favorite pastime of beekeepers for centuries. If you are interested in doing this, have a few empty hives on hand. Some beekeepers locate empty “trap hives” or “bait hives” near their own hives. Often, a swarm flying out of one of your own hives will move into the trap hive, since it is much like what the bees are searching for. In this way, the beekeeper manages to catch and save the bees, although the source hive is weakened. Unswarmed colonies will be boiling with bees. The queen's rate of egg laying may drop a bit this month. The main honey flow should happen this month. Swarms may be infested with tracheal mites. Combine all swarms issuing after June 1 with weak colonies. The bees are much less active. The honey flow often ends, and the beekeeper will notice that stings are more frequent! This is because the foragers have less to do, and consequently spend more time at home guarding the hive. Swarming is still possible, but much less likely. Inspect the hive weekly to make certain the hive is healthy and the queen is present. Add honey supers as needed. Combine all swarms issuing after June 1 with weak colonies. Continue to check for swarm cells every seven days. Continue to add supers of drawn comb as needed until the honey flow ends. Remove the capped honey after June 15. Uncapped honey can be removed two weeks after the honey flow ends. Prepare to move your bees to the mountains or to lima bean-, soybean- and cotton-growing areas from the second honey flow if you want maximum production. Store all supers of honey in a warm, 90 degrees F, dust-free, screened room. If the weather is good, the nectar flow may continue this month. On hot and humid nights, you may see a huge curtain of bees cooling themselves on the exterior of the hive. Continue inspections to assure the health of your colony. Extract honey you removed in June to have the supers available for the sourwood honey flow. Return extracted supers to the colonies just before dark to prevent robbing. Pack honey in a quality, attractive package - all new, clean glassware or plastic ware and lids. For Sourwood [blossoming late June – end of July] honey flows, have your bees in their new location by the first week of July. Fumigate all supers of extracted combs that will be off the colonies for more than four days. Combine swarms issuing after July 15 with weak colonies. The colony's growth is diminishing. Drones are still around, but outside activity begins to slow down as the nectar flow slows. The bees are still rearing brood, but storing little honey. No more chance of swarming. Because of the dearth of nectar, late summer is the time for bees to try to rob honey from other hives. August is a serious month for varroa mites. The mites have been reproducing rapidly in the brood cells since spring. Their numbers can build up without any apparent signs of trouble and then suddenly destroy a hive within a few weeks. Nectar and pollen dearth !!! Watch for honey robbing by wasps or other bees – Don’t open a hive for more than a few minutes. Unguarded honey leads to a “robbing frenzy”. Even if you then close the hive, the robbing bees remain in the same frame of mind. Stronger hives will do their best to fight their way into the weaker hives. Watch for fighting bees at the entrances of the hives. Check brood nest for diseases and mites. Remove surplus honey, leaving some space in supers for later summer and fall flow. Colonies will need 40-60 pounds of honey for overwintering. Extract supers of honey removed from colonies. Return extracted supers to colony for cleaning just before dark to prevent robbing by colonies. Remove cleaned supers from colony, and store under para-Di-chloro-benzene fumigation to prevent wax moth damage. If you are considering medicating your bees, August is the month to begin treatments. See the page on Medicating Bees for more information. Re-queening is another consideration for beekeepers as they seek to bolster their colonies. And when asking 10 beekeepers, you will get 10 different answers. Related to re-queening, some prefer fall and some spring. If in the fall, August is the month to begin the process. A weak hive should be de-queened and united with a stronger hive. Consider feeding each a pollen patty, ¼ to ½ a patty at a time (only what the colony can consume in 5 days) depending on pollen stores/collection. Check at the third week and continue to feed heavy 2:1 or 1:1 sugar syrup to colonies as necessary.